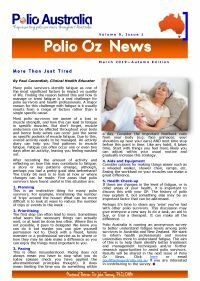 Polio Oz News is published each March, June, September and December and distributed widely via electronic means throughout Australia and many countries overseas. Polio Oz News chronicles information obtained from an extensive range of Australian and international sources, including the latest in post-polio research, articles from health professionals, polio stories, reports of Polio Australia’s activities, government initiatives, current affairs, and more. To access each year’s issues of Polio Oz News, please click on the images below.